We have welcomed the launch of an inquiry report into the arts, health and wellbeing. We have used the arts to improve patient health and encourage quicker recovery through our Fresh Arts programme. Fresh Arts aims to enhance patient experience and improve morale across Southmead and Cossham Hospitals. The programme includes arts commissions, rolling exhibitions and other arts-based activities and projects that have emotional and physical benefits for patients, staff and visitors. One successful ongoing project is ‘Knit With Me’, a collaboration with textile artist Ali Brown. Ali knits with patients on the wards, and leaves material for patients to carry on with during their stay at hospital. The project provides a calming effect for patients, while creating visual, touch and emotional stimulation. 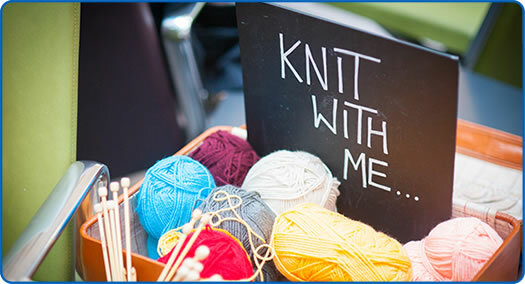 Knit With Me is just one of the many successful Fresh Arts projects which has shown the benefit of the arts in hospital. Arts Programme Manager at North Bristol NHS Trust, Ruth Sidgwick said: “NBT is an advocate for using the arts, as research has shown that this can save the NHS money by improving patient wellbeing, reducing the need for medication and getting patients home quicker.